As temperatures drop to 20 below freezing in Chicago, the polar vortex is playing havoc with more than just traffic and public health. The freakish weather conditions are drastically altering the appearances of everything from hair to entire rivers. And now even good old fashioned carbs – usually a trustworthy source of comfort – are being warped beyond recognition by the extreme chill. 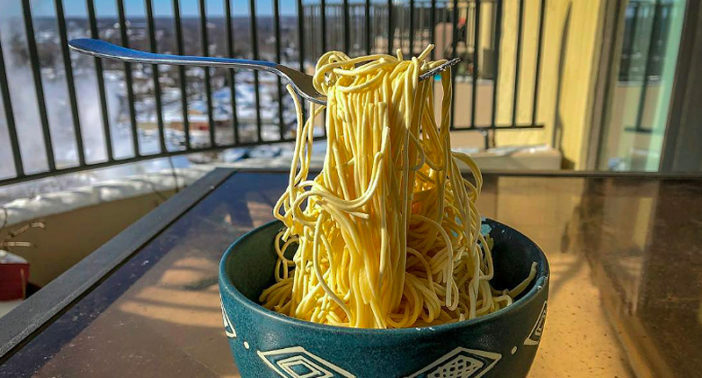 When Chicago resident James David first brought his ‘piping hot’ bowl of spaghetti out onto his apartment balcony, it was just a regular old pasta dish. However, the bitter climate rapidly twisted it into a work of art. According to comments made by James on his Instagram, in ‘just about a minute’ the spaghetti was frozen solid; holding the fork in place. The suspended in mid air effect is mesmerising and appears nearly magical, as if the spaghetti is being twirled by an invisible, ghostly hand. There’s really no good reason to be outside. James isn’t the only person in the affected areas to get a weird and wonderful impromptu science lesson. One person watched their hot coffee transform into snow after chucking it up in the air (do not try this at home unless you fancy a night in A&E). Another ‘Chiberia’ resident saw their t-shirt frozen solid, while a woman in Iowa headed outside with wet hair, only to find her tresses transformed into a wintery ice sculpture.